All whales and dolphins are descended from terrestrial mammals, ancient creatures that were very similar to the modern hippopotamus. Now, a fascinating new genetics study shows the incredible evolutionary changes these animals had to experience to become the perfectly adapted marine animals we see today. Biologists aren't entirely sure which creature modern cetaceans (dolphins, whales, and porpoises) are descended from. The traditional theory suggests mesonychids, an extinct order of carnivorous ungulates (hoofed animals) which resembled wolves. But more recent genetic analysis points to artiodactyls, a hippo-like creature. Regardless, all cetaceans were land mammals at one point in their evolutionary history — and they had to undergo some rather remarkable changes to adapt to underwater life. Why are dolphins smarter than most other mammals? Recently, researchers from Korea Institute of Ocean Science and Technology, Korea Genome Research Foundation, BGI, and other institutes, performed a comprehensive analysis of the genomes of several cetaceans, including the minke whale, fin whale, bottlenose dolphin, and a finless porpoise. They did so to improve their understanding of the evolutionary changes required for terrestrial mammals to adapt to the ocean — but at the level of the genome. First and foremost, the adaptation to ocean life was marked by resistance to physiological stresses caused by a lack of oxygen and high salt levels. The researchers were able to identify several whale-specific genes strongly associated with these crucial adaptations, including the peroxiredoxin (PRDX) family, O-linked N-acetylglucosaminylation (O-GlcNAcylation). Basically, adaptations to the water favored those mutations that were associated with stress-responsive proteins and anaerobic metabolism. But the researchers say the most dramatic environmental adaptation for whales is the ability to dive deep underwater, a feat that would normally induce hypoxia. Typically, when a terrestrial mammals dives too deep, its body produces more reactive oxygen species (ROS) — harmful compounds that can damage DNA. But the body can also produce glutathione, a a well-known antioxidant that prevents damage to important cellular components by ROS. So not surprisingly, the researchers found an increased ratio of reduced glutathione/glutathione disulfide when whales experience hypoxic or oxidative stress. Other studies have shown how whales can hold their breath for up to an hour. Lastly, in the case of minke whales, the researchers uncovered the mechanisms required for the evolutionary transition from teeth to baleen. The study affirmed previous research showing connections between several genes — or pseudogenes — that play a role in tooth enamel formation and biomineralization (namely the genes ENAM, MMP, and AMEL). 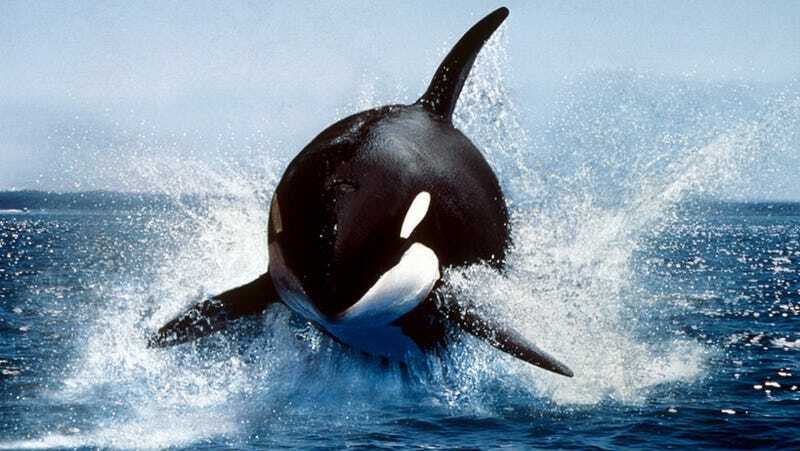 The researchers also found that the gene families related to whale's body hair and sensory receptors had shrunk, including Keratin-related gene families associated with hair formation and several Hox genes that play an important role in the body plan and embryonic development. Read the entire study at Nature: "Minke whale genome and aquatic adaptation in cetaceans". Images: Killer whale breaching, Gerard Lacz/Animals Animals - Earth Scenes via National Geographic.